Ferroglobus placidus belongs to the order Archaeoglobales within the archaeal phylum Euryarchaeota. Strain AEDII12DO is the type strain of the species and was isolated from a shallow marine hydrothermal system at Vulcano, Italy. It is a hyperthermophilic, anaerobic chemolithoautotroph, but it can also use a variety of aromatic compounds as electron donors. Here we describe the features of this organism together with the complete genome sequence and annotation. The 2,196,266 bp genome with its 2,567 protein-coding and 55 RNA genes was sequenced as part of a DOE Joint Genome Institute Laboratory Sequencing Program (LSP) project. Strain AEDII12DO (=DSM 10642) is the type strain of the species Ferroglobus placidus. It was isolated from a shallow hydrothermal vent system at Vulcano Island, Italy . F. placidus is metabolically quite versatile. It was isolated based on its ability to use ferrous iron as an electron donor, and was also shown to use hydrogen and sulfide as electron donors, with nitrate or thiosulfate as electron acceptors . Subsequently, it was shown to produce N2O from nitrite, which is an unusual ability for an anaerobic organism . It can also oxidize acetate and several aromatic compounds using ferric iron as the electron acceptor [3,4]. F. placidus is the first archaeon found to anaerobically oxidize aromatic compounds . The genes and pathways involved in degradation of benzene, benzoate, and phenol have been recently characterized [5,6]. F. placidus is the only species in the genus Ferroglobus. It belongs to the family Archaeoglobaceae, which also contains the genera Archaeoglobus and Geoglobus. Genome sequences have been published for A. fulgidus and A. profundus [7,8]. Figure 1 shows the phylogenetic relationships between members of the family Archaeoglobaceae. 16S ribosomal RNA phylogenetic tree of Archaeoglobaceae. The tree was generated with weighbor  through the Ribosomal Database Project website  and displayed with njplot . Organisms with two asterisks after the name are those with complete genomes sequenced and published. Those with one asterisk have a genome project in progress, according to the Genomes OnLine Database . Methanocaldococcus jannaschii is the outgroup. F. placidus was isolated from a mixture of sand and water at a beach close to Vulcano Island, Italy . The sample was taken from a depth of 1 m; the temperature of the sample was 95°C and the pH was 7.0 . A 1.0 mL aliquot of the sample was incubated in FM medium at 85°C with shaking. The medium contained FeS as an electron donor . F. placidus was isolated from the enrichment culture using optical tweezers . The cells are irregular cocci with a triangular shape, and one or two flagella were present . Growth occurred between 65°C and 95°C with an optimum of 85°C . The optimal pH for growth was 7.0, and growth was observed over a range of 6.0 ­to 8.5 . The optimal salinity for growth was 2.0%, with growth occurring between 0.5 and 4.5% NaCl . F. placidus could use ferrous iron, hydrogen, or sulfide as electron donors and nitrate or thiosulfate as electron acceptors . F. placidus also can anaerobically oxidize aromatic compounds with ferric iron as electron acceptor. The aromatic compounds it can utilize include benzene, benzoate, phenol, 4-hydroxybenzoate, benzaldehyde, p-hydroxybenzaldehyde and t-cinnamic acid [4,5]. The features of the organism are listed in Table 1. Classification and general features of F. placidus AEDII12DO according to the MIGS recommendations . This organism was selected for sequencing based on its phylogenetic position and its phenotypic differences from other members of the family Archaeoglobaceae. It is part of a Laboratory Sequencing Program (LSP) project to sequence diverse archaea. The genome project is listed in the Genomes On Line Database  and the complete genome sequence has been deposited in GenBank. Sequencing, finishing, and annotation were performed by the DOE Joint Genome Institute (JGI). A summary of the project information is shown in Table 2. The strain Ferroglobus placidus AEDII12DO (containing plasmid XY) has been deposited in the Deutsche Sammlung von Mikroorganismen und Zellkulturen (DSMZ) by Prof. Dr. K. O. Stetter, Lehrstuhl für Mikrobiologie, Universität Regensburg, Universitätsstr. 31, D-93053 Regensburg, Germany as DSM 10642. F. placidus strain AEDII12DO was obtained from the DSMZ. Strict anaerobic culturing and sampling techniques were used throughout [22,23]. Ten 100 ml bottles of F. placidus cells were grown with acetate (10 mM) as the electron donor, and Fe(III) citrate (56 mM) as the electron acceptor. F. placidus medium was prepared as previously described . After autoclaving, FeCl2 (1.3 mM), Na2SeO4 (30 µg/L), Na2WO4 (40 µg/L), APM salts (1 g/L MgCl2, 0.23 g/L CaCl2), DL vitamins  and all electron donors were added to the sterilized medium from anaerobic stock solutions. Cultures were incubated under N2:CO2 (80:20) at 85 °C in the dark. For extraction of DNA, cultures (100 ml in 156 ml serum bottles) were divided into 50 ml conical tubes (Falcon), and cells were pelleted by centrifugation at 3,000 x g for 20 minutes. Cell pellets were resuspended in 10 ml TE sucrose buffer (10 mM Tris, pH 8.0, 1 mM EDTA, and 6.7% sucrose). The resuspended cells were distributed into 10 different 2 ml screw cap tubes and 3 µl Proteinase K (20 mg/ml), 30 µl sodium dodecyl sulfate (10% solution), and 10 µl RNase A (5 ug/ul) were added to each tube. Tubes were incubated at 37ºC for 20 min, and centrifuged at 16,100 x g for 15 minutes. The supernatant was transferred to a new set of tubes and 600 µl phenol (TE saturated, pH 7.3), and 400 μl chloroform-isoamyl alcohol were added. These tubes were then mixed on a Labquake rotator (Barnstead/Thermolyne, Dubuque, Iowa) for 10 min and centrifuged at 16,100 x g for 5 min. The aqueous layer was removed and transferred to new 2-ml screw cap tubes. The phenol/chloroform extraction step was performed again. The aqueous layer was transferred to a new tube, and 100 µl 5 M ammonium acetate, 20 µl glycogen (5 mg/ml; Ambion), and 1 ml cold (-20 °C) isopropanol (Sigma) were added. Nucleic acids were precipitated at -30 °C for 1 hour and pelleted by centrifugation at 16,100 x g for 30 min. The pellet was then cleaned with cold (-20 °C) 70% ethanol, dried, and resuspended in sterile nuclease-free water (Ambion). The genome of F. placidus was sequenced at the Joint Genome Institute using a combination of Illumina and 454 technologies. 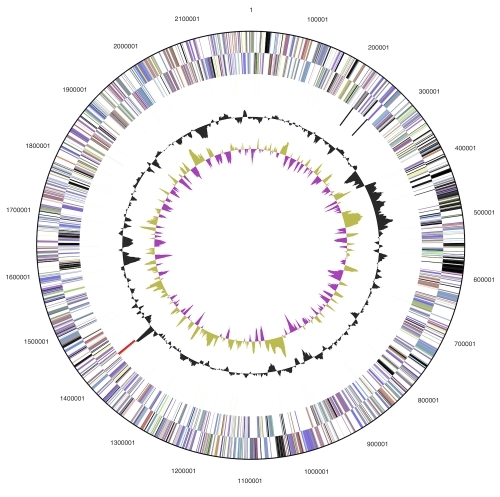 An Illumina GAII shotgun library with reads of 539 Mb, a 454 Titanium draft library with average read length of 292.3 bases, and a paired-end 454 library with an average insert size of 15.5 Kb were generated for this genome. All general aspects of library construction and sequencing performed at the JGI can be found at the DOE JGI website . Illumina sequencing data was assembled with Velvet , and the consensus sequences were shredded into 1.5 kb overlapped fake reads and assembled together with the 454 data. Draft assemblies were based on 104 Mb 454 draft data and 454 paired end data. The initial Newbler assembly contained 33 contigs in 1 scaffold. We converted the initial 454 assembly into a phrap assembly by making fake reads from the consensus, collecting the read pairs in the 454 paired end library. The Phred/Phrap/Consed software package  was used for sequence assembly and quality assessment [28-30] in the following finishing process. After the shotgun stage, reads were assembled with parallel phrap (High Performance Software, LLC). Possible mis-assemblies were corrected with gapResolution (Cliff Han, unpublished), Dupfinisher , or sequencing cloned bridging PCR fragments with subcloning or transposon bombing (Epicentre Biotechnologies, Madison, WI). Gaps between contigs were closed by editing in Consed, by PCR and by Bubble PCR primer walks. A total of 43 additional reactions were necessary to close gaps and to raise the quality of the finished sequence. The genome includes one circular chromosome and no plasmids, for a total size of 2,196,266 bp (Table 3 and Figure 2). This genome size is almost the same as that of A. fulgidus and approximately 0.6 Mbp larger than that of A. profundus. The mol percent G+C is 44.1%, close to the values found in the Archaeoglobus genomes. A total of 2,622 genes were identified, 55 RNA genes and 2,567 protein-coding genes. There are 87 pseudogenes, comprising 3.4% of the protein-coding genes. The start codon is ATG in 83.7% of the genes, GTG in 12.2%, and TTG in 5.8%. This distribution is more similar to that of A. profundus, to which F. placidus is closely related (Figure 1), than to that of A. fulgidus. There is one copy of each ribosomal RNA. The 5S rRNA is not found adjacent to the 16S and 23S rRNAs. Table 4 shows the distribution of genes in COG categories. Some aspects of the genome of F. placidus have been compared with those of A. fulgidus and A. profundus . Here we will focus on some additional aspects of the F. placidus genome. F. placidus has been found to use nitrate as an electron acceptor and produces N2O with NO as an intermediate . Genes likely to encode a nitrate reductase (Ferp_0311-0314) and an adjacent nitrate transporter (Ferp_0315) were identified. Based on the experimental results, F. placidus is expected to have a nitric oxide-forming nitrite reductase. There are two types of this protein: cytochrome cd1 type and copper type . F. placidus appears to lack both of these types of nitrite reductase, so it may have a new version of this enzyme. F. placidus was found to produce N2O, and it has a NorBC-type nitric oxide reductase (Ferp_1340-1341). Surprisingly it also has a nitrous oxide reductase (Ferp_0128), suggesting that under some conditions F. placidus may carry out complete denitrification from nitrate to N2. F. placidus likely can not metabolize sugars as the Entner-Doudoroff pathway is absent from its genome, and the critical rate-limiting enzyme in the glycolysis pathway, 6-phosphofructokinase, also could not be identified. 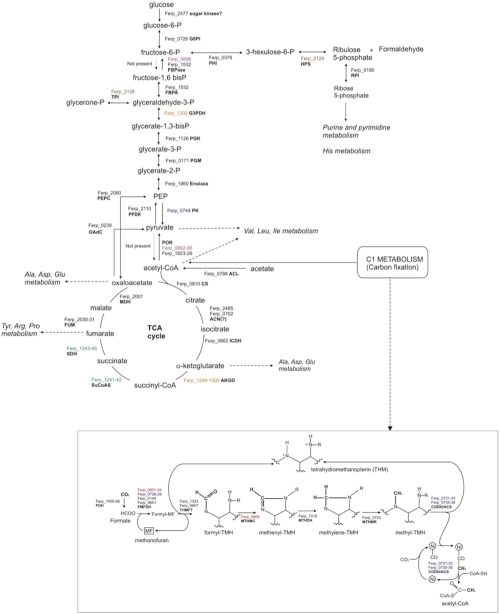 A complete gluconeogenesis pathway is present (Figure 3), including the recently discovered archaeal bifunctional fructose bisphosphate aldolase/phosphatase (Ferp_1532) . A second fructose bisphosphate phosphatase may be present (Ferp_0896). Biosynthesis of C5 sugars for anabolic purposes proceeds through the reverse ribulose monophosphate pathway [40,41], in which fructose 6-phosphate is converted to hexulose 6-phosphate, from which formaldehyde is cleaved and ribulose 5-phosphate is generated. Central metabolism of the hyperthermophilic archaeon Ferroglobus placidus. Abbreviations: G6PI: glucose-6-phosphate isomerase. FBPase: fructose-1,6-bisphosphatase. FBPA: fructose-1,6-bisphosphate aldolase. G3PDH: glycerol-3-phosphate dehydrogenase. TPI: triose-phosphate isomerase. PGK: phosphoglycerate kinase. PGM: phosphoglycerate mutase. PEP: phosphoenolpyruvate. PEPC: phosphoenolpyruvate carboxylase. PK: pyruvate kinase. PPDK: phosphoenolpyruvate dikinase. OadC: oxaloacetate decarboxylase. POR: pyruvate ferredoxin reductase (pyruvate synthase). ACL: acetyl-CoA ligase. AP: acetate phosphatase. CS: citrate synthase. ACN: aconitase. ICDH: isocitrate dehydrogenase. AKGD: alpha-ketoglutarate dehydrogenase. SuCoAS: succinyl-CoA synthase. SDH: succinate dehydrogenase. FUM: fumarase. MDH: malate dehydrogenase. PHI: 3-hexulose-6-phosphate isomerase. HPS: 3-hexulose-6-phosphate synthase. RPI: ribose-5-phosphate isomerase. FDH: formate dehydrogenase. MF: methanofuran. FMFDH: formylmethanofuran dehydrogenase. THM: tetrahydromethanopterin. THMFT: tetrahydromethanopterin formyl transferase. MTHMC: methenyltetrahydromethanopterin cyclohydrolase. MTHMR: methylentetrahydromethanopterin reductase. CODH/ACS: CO dehydrogenase/acetyl-CoA synthase. Gene designations in colors indicates association in clusters. Similar to Archaeoglobus species, F. placidus is capable of autotrophic growth. The genome contains a gene coding for the large subunit of ribulose-1,5-bisphosphate carboxylase/oxygenase (RubisCO, Ferp_1506), which fixes CO2 in photosynthetic organisms, but many other enzymes of the Calvin-Benson cycle are missing. F. placidus probably uses RubisCO as part of an AMP recycling pathway  rather than for carbon fixation. F. placidus also contains the complete acetyl-CoA reductive pathway. Based on experimental results it was predicted to use this pathway for carbon fixation . This pathway is composed of a methyl branch that reduces CO2 into a methyl group by a sequence of reactions similar to those found in methanogenesis (Fig. 3, inset), and a carbonyl branch that converts a second CO2 molecule into a carbonyl group. The two moieties are then joined to form acetyl-CoA. Interestingly, there are two full copies of pyruvate ferredoxin oxidoreductase (POR, Ferp_0892-95 and Ferp_1823-26, 32-42% identical/47-60% similar), which generates pyruvate from acetyl-CoA and CO2. Conversely, the genome does not contain genes coding for the pyruvate dehydrogenase complex. All of the enzymes that comprise the TCA cycle could be accounted for, with the exception of a typical aconitase. However, two genes annotated as homoaconitate hydratase (Ferp_0702 and Ferp_2485) are 40% similar to the characterized aconitase from the thermoacidophilic archaeon Sulfolobus acidocaldarius . Also F. placidus has the two subunits of a predicted aconitase (Ferp_0107-0108) . Even though the genes involved in central metabolism are typically scattered in the genome, it is worth noting that many of these genes are grouped in clusters in F. placidus. For instance, the genes coding for the formylmethanofuran dehydrogenase (FMFDH, Ferp_0601-04) are located near the methenyltetrahydromethanopterin cyclohydrolase gene (MTHMC, Ferp_0606) from the reductive acetyl-CoA pathway. Similarly, two subunits of FMFDH (Ferp_0728-29), the methylenetetrahydromethanopterin reductase gene (MTHMR, Ferp_0743), the whole CO dehydrogenase/acetyl-CoA synthase operon (CODH/ACS, Ferp_0731-33, Ferp_0735-36), and the pyruvate kinase gene (PK, Ferp_0744), are in close proximity. The operon that contains the genes coding for one of the POR complexes (Ferp_0892-96) also includes genes coding for other enzymes that belong to central metabolism, such as one of the FBPases (Ferp_0896), an ATP-NAD kinase (Ferp_0897), and shikimate dehydrogenase (Ferp_0898), which participates in the biosynthesis of aromatic amino acids. The work conducted by the US Department of Energy Joint Genome Institute is supported by the Office of Science of the U.S. Department of Energy under Contract No. DE-AC02-05CH11231. Garrity GM, Holt JG. Phylum AII. Euryarchaeota phy. nov. In: Bergey’s Manual of Systematic Bacteriology, vol 1. 2nd ed. Edited by: Garrity GM, Boone DR, Castenholz RW. Springer, New York; 2001; pp 211-355. Garrity GM, Holt JG. Class VI. Archaeoglobi class. nov. In: Bergey’s Manual of Systematic Bacteriology, vol 1. The Archaea and the deeply branching and phototrophic Bacteria. Springer, New York; 2001; pp 349. Huber H, Stetter KO. Order I. Archaeoglobales ord. nov. In: Bergey’s Manual of Systematic Bacteriology, vol. 1. The Archaea and the deeply branching and phototrophic Bacteria. Springer, New York; 2001; pp 349. Huber H, Stetter KO. Family I. Archaeoglobaceae fam. nov. In: Bergey’s Manual of Systematic Bacteriology, vol. 1. The Archaea and the deeply branching and phototrophic Bacteria. Springer, New York; 2001; pp 349.